During the Builder's Gala, which took place on March 21, 2019 at the Zamojski Palace in Warsaw, at the headquarters of the Association of Polish Architects, the TopBuilder 2019 awards in architecture and construction, public and private investment as well as science and education were granted. The Deckshield parking floor system produced and supplied by Flowcrete Polska received the TopBuilder statuette in the category innovative product recommended and verified by the market. TopBuilder is one of the most appreciated awards on the Polish construction market. The editors of the Builder monthly and the Chapter award the highest quality products and construction solutions as well as implementations in which modern architectural, structural, material and technological solutions as well as IT products for architecture and construction have been used. The partner of this year's 11th edition is the Association of Polish Architects. Deckshield is a group of the highest quality flexible, polyurethane, waterproof parking floors. They have high resistance to abrasion and to chemical substances – they are resistant, among others to petrol, diesel, motor oil and other automotive fluids and chlorides contained in de-icing salts. The flooring systems from this group have very good crack bridging abilities. They also have a non-slip texture, and thanks to a wide range of colours, they allow for marking pedestrian routes, parking spaces and traffic organization, which increases the safety of parking users and allows to create aesthetic and user-friendly space in a car park. „I am very proud of the TopBuilder award for our flagship product, the Deckshield car park decking system, which has been present on the Polish market for 15 years. 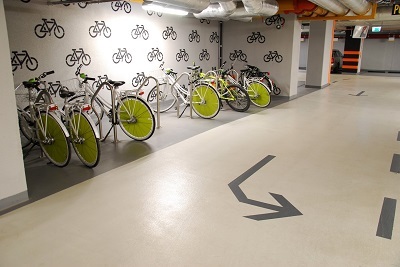 During this time, the floor system has gained the recognition of investors as a product that works well in demanding conditions of use, including on parking lots in office buildings or in shopping centres. Deckshield floors, especially in the version with a flexible membrane, have the best crack bridging properties on the market. Thanks to this, they can also be used on outdoor parking lots, on the roofs of buildings exposed to difficult weather conditions, – said Barbara Radziwon, Managing Director of Flowcrete Central & Eastern Europe, during the award ceremony. Deckshield floors are manufactured by Flowcrete Polska in its own production plant in Warsaw. They were applied, among others on the parkings in Warsaw Spire, Q22 or in the Bobrowiecka 8 office building in Warsaw and in office buildings in other Polish cities (including the BUMA complex in Kraków or the Alchemia complex in Gdańsk). They were also applied in car parks in such facilities as the largest entertainment and commercial centre in Wielkopolska region – Posnania, the Museum of the Second World War in Gdańsk or the Szczecin Philharmonic in Szczecin. 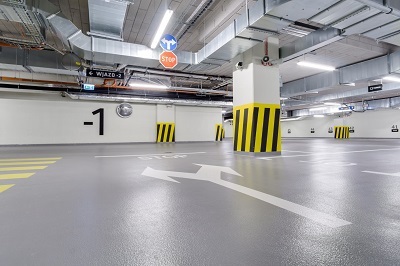 One of the first implementations of Deckshield floors in Poland include parking lot at the Intercontinental Hotel and a parking lot at the Reduta Shopping Centre in Warsaw from 2003 and 2004.